This year marks the 75th anniversary of the invention of the SMIRNOFF Moscow Mule and we have teamed up with the brand to help you celebrate this occasion in your bar. 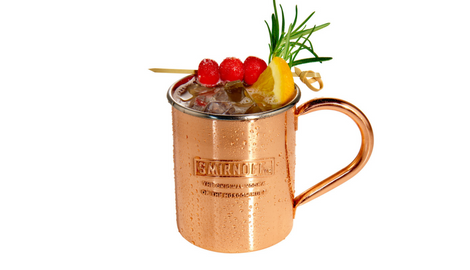 As well as the traditional recipe, SMIRNOFF have created new recipes to give your Moscow Mules a ‘merry twist’. Make sure you make the most of this occasion and download your free poster and recipe cards for your bar at the end of the article! It all started in 1941 in America when two men came together to create the game changing cocktail. One of the men owned a brand of ginger beer, but unfortunately, most Americans didn’t know what ginger beer was, preferring the sweeter taste of ginger ale. Americans were not familiar with vodka either, preferring whiskies and bourbons. John Martin of Heublein (now The Smirnoff Co.) knew that if SMIRNOFF Vodka was going to have a fighting chance to compete with the whiskies it would have to start as a mixer. So, he got together with an L.A. restauranteur and paired SMIRNOFF No. 21 Vodka with the ginger beer and a spritz of lime for a simple, yet effective combination they dubbed the “Moscow Mule.” The origin of the name is somewhat of a mystery to this day, but as the story goes, it has to do with the fact that the Moscow Mule has a nice “kick” to it. Next, they hit the road, pouring Moscow Mules and convincing bartenders to do the same. Legend has it they would snap a Polaroid picture of the bartender mixing things up with SMIRNOFF Vodka, then show that photo to the next bar, and keep the cycle going until they'd convinced the whole country to try the cocktail. 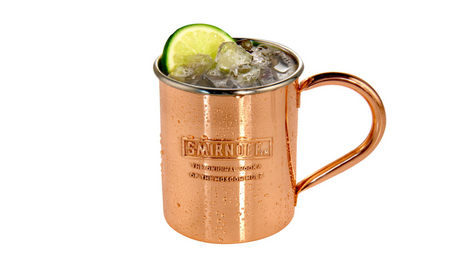 The 75th anniversary of the invention of the SMIRNOFF Moscow Mule is the perfect opportunity to offer your customers a Moscow Mule cocktail. With mixed spirit drinks being the most profitable drink your outlet can sell, it really makes sense to use all the available tools to influence your customers’ choice. A cocktail menu featuring a range of Moscow Mule cocktails can really help promote these mixed drink sales and it gives you the opportunity to suggest new drink ideas to your customer while allowing them to be inspired and make informed decisions. Take a look at some of the new festive SMIRNOFF Moscow Mule serves below and don’t forget to download your free poster, recipe cards and Facebook cover image at the end of the article. 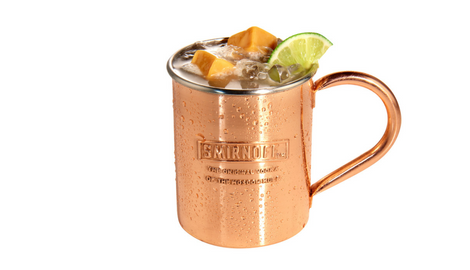 Ready to celebrate the 75th anniversary of the SMIRNOFF Moscow Mule? Have a look at these key serves. From the original recipe to some ‘merry twists’ on the Moscow Mule. Fill a copper mug with cubed ice. Squeeze in fresh orange and stir. Garnish with cranberries, an orange slice and a rosemary sprig. Top with ginger beer and bitters. Squeeze in fresh lime and stir. Garnish with caramel cubes and a lime wedge. Celebrate the 75th anniversary of the SMIRNOFF Moscow Mule in your bar and download our free SMIRNOFF Moscow Mule menu and recipe cards for your bar!